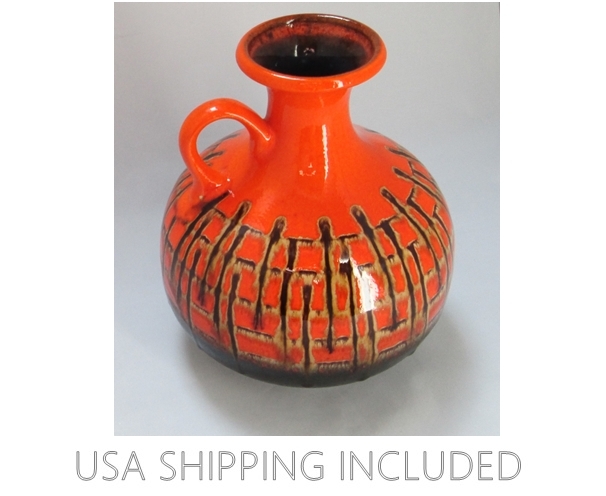 This striking jug vase was made in West Germany by Jasba Keramic, known for their vibrantly colored ceramics. The company was founded in 1926, producing styles like this one in the 1960's. They're still in business, but production of decorative vases stopped in 1971 and they currently make tiles for kitchens and bathrooms. The name JASBA is an acronym of the name of the founder Jakob (JA) Schwaderlapp (S) and the town of Baumbach (BA). He also founded the Ceramano factory, but that's another story for another time. This is form number 1231-20, with a high loop handle, a flared trumpet mouth and a bulbous bottom tapering to a small round foot. The number is embossed on the bottom along with the oval Jasba mark, which is very clear (often they're very faint). The clay used is the off-white typical of Jasba--they used white clay, also. A brown drip glaze was used that pooled in droplets at the bottom of many of its paths over the high gloss orange, but not thickly like fat lava. The bottom quarter of the vase was done in a semi-gloss black glaze on all but the dry foot ring; the interior appears to be washed in a dark blue. This vase stands 7 1/2 inches tall, is 6 1/2 inches across the belly and sits on a 3 1/2 inch diameter base. The mouth is 2 1/2 inches across and the vase weighs 1 3/4 pounds. It's in spectacularly excellent condition, ready to warm the heart of any collector or decorator. Note: Any white spots in the photos are from the lighting.